Nancy began to develop her interest in music at age fifteen, when her brother taught her one guitar song - "8 days a week" by the Beatles. This got Nancy hooked and she began to pursue her musical interest, focusing on the guitar. A few years later Nancy met Steve, her musical development accelerated. He declared that if she was going to "hang around she'd better learn to play the guitar!" this opened many different musical avenues, leading to the discovery of Nancy's vocal talents, including a magical sounding harmony. Nancy soon became a member of Life After 9. 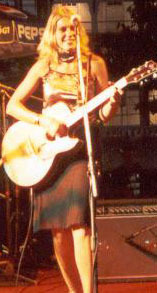 She toured with them in Canada for three years and relocated with them to Thailand. Nancy provides the solid rhythm of the group, helps to compose songs and is the friendly face of LA9 captivating all she meets.